Supreme Court is due to hear the matter of SS Norway (Blue Lady)on 22nd January 2007. There are two clarification applications pending before the court in the wake of the September 6 and September 11, 2007 order by the Justice Arijit Pasayat and Justice S H Kapadia bench. The Supreme Court had also directed Government of India to constitute a new Committee consisting of MoEF, GPCB, GMB, AERB that shall verify all the documents before ship is allowed for breaking. This committee is yet to be formed. European and Norwegian silence in the matter especially in the aftermath of Le Clemenceau precedent is deafening. On 7th January, 2008, UN delegates visited Alang and took pictures of SS Norway (Blue Lady) and proved both international and national media that had misreported that the ship has been dismantled wrong. Some 30 ships await permission from the apex court. Also Le Clemenceau has not been dismantled yet. It might get permission until the end of 2008. In Brest, the French Defence Minister, Herve Morin, said that the choice of the industry would be known in one or two months, "no later than the end of February". Perhaps Ms. Connie Hedegaard, Danish Minister for the Environment had a premonition of things to come when she wrote to the Indian Environment Minister in April, 2005. She wrote, "The ship owners escaped Danish authorities, misleading Danish officials that had ordered the Kong Frederik IX to remain in Denmark until it had been decontaminated." The shipowners continue to violate rule of law as has become evident from the case of S S Norway and Le Clemenceau with impunity. But unlike Denmark, other countries like Norway and Germany have connived at the acts of omission of commission by the shipowners with India being callous towards environmental and occupational health of its citizens. At the launch of the Global Programme for Sustainable Ship Recycling and a one-day seminar on 12-13 January 2008 in Dhaka, Bangladesh. It emerged that South Asian position was quite categorical in their demand for pre-cleaning of ships in the country of export. The South Asians also demanded a liability management plan from the shipowners. The delegates also visited Chittagong ship-breaking yard. Amid repeated references to Le Clemenceau, RIKY (Kong Frederik IX), SS Norway (Blue Lady, in the recent picture of January 2008) and their explicit acts of fraudulent documentation, the platform of labor, human rights, and environmental NGOs walked out of the International Maritime Organization's (IMO) workshop protesting against the lack of even an iota of sensitivity towards environment and workers issue in the ship-breaking industry. The workshop titled "IMO National Workshop on the development of the International Convention for the Safe and Environmentally Sound Recycling of Ships" happened during 7 – 10 January 2008. IMO is developing a Convention providing globally applicable ship recycling regulations for international shipping and for recycling activities. Earlier, IMO had adopted Guidelines on Ship Recycling at the 23rd Assembly in November-December 2003. At its 53rd session in July 2005, the Marine Environment Protection Committee (MEPC) agreed that the IMO should develop, as a high priority, a new instrument on recycling of ships with a view to providing legally binding and globally applicable ship recycling regulations for international shipping and for recycling facilities. MEPC 53 also agreed that the new IMO instrument on ship recycling should include regulations for the design, construction, operation and preparation of ships so as to facilitate safe and environmentally sound recycling, without compromising the safety and operational efficiency of ships; the operation of ship recycling facilities in a safe and environmentally sound manner; and the establishment of an appropriate enforcement mechanism for ship recycling (certification/reporting requirements). MEPC 53 further agreed that the above-mentioned instrument should be completed in time for its consideration and adoption in the biennium 2008-2009. - the establishment of an appropriate enforcement mechanism for ship recycling, incorporating certification and reporting requirements. The interests of other stakeholders including the International Labor Organization, trade unions, the United Nation's Basel Convention, shipyard workers, green ship recyclers, and environmental and human rights organizations were deemed inappropriate. The workshop did not have any presentation from any NGO or trade union. The contention of the Member Secretary, Gujarat Pollution Control Board (GPCB) saying that as per the recent Supreme Court order Decontamination Certificate is required after beaching. GPCB claimed that it has been entrusted the responsibility of occupational safety although it is ill equipped to deal with worker issue. The civil society representative was not allowed to voice environmental and workers' concerns. The development of the IMO convention on ship recycling is progressing according to the work plan which foresees that the convention will be adopted by a diplomatic conference to be held possibly in Hong Kong in April 2009. Between now and the provisional date of the diplomatic conference there are only limited opportunities for further developing the draft convention and for resolving the numerous issues where agreement is still needed. The first such meeting is the 3rd Intersessional Working Group on Ship Recycling which is scheduled to be held from 21 to 25 January 2008. The workshop attempted to argue that the draft treaty does not require that the shipping industry to ensure prior decontamination of toxic materials in the country of export. Under the influence of ship owners and ship owning countries like Norway, the workshop witnessed tough resistance to proposal of absolving ship owners to pay the bill for cleaning-up past contamination, improving the present situation or ensuring green shipbreaking capacity in the future. The workshop attempted to steer clear of well established "Polluter Pays Principle" although it was repeatedly raised by the Indian delegates. The ship recycling countries were being made to bear the financial burden of the entire industry in proposal. The meeting has been dominated by shipping industry interests and the national shipping powers -- Norway, USA and Japan and others. There was an admission at the workshop that 90% of the documentation in the ship-breaking industry was fake and most of the certificates that relate to ship's ownership, workers and environmental safety are cooked. Currently about 95% of the world's asbestos and PCB laden ships are scrapped by the world's poorest, most unprotected, and desperate workforce. That is immoral, and an affront to both human rights and the environment. But countries like Norway, leading the drafting of this Convention seem intent to perpetuate this disproportionate transfer of harm to the poor. The findings made by a special 12-member Committee of Technical Experts, headed by Secretary, Ministry of Environment and Forests. The report by the generally conservative committee indicated that x-rays of workers show asbestosis disease in 16% of the workforce and an alarming rate of accidental death of 2 workers in 1000 per year. Asbestosis is a lung disease, which causes respiratory debilitation, and failure and can lead to lung cancer. There is no cure. This report has been accepted by the Supreme Court by its order dated 11 September, 2007. The matter is still sub judice. Meanwhile High Court Division of Bangladesh Supreme Court has also admitted a similar petition to set matters right over there. Dr. Nikos Mikelis, Implementation Officer, Marine Environment Division, IMO who moderated the workshop was quite biased and he deemed the occupational health and local communities not germane to the issue of ship-breaking. Clearly, he acted as the mouthpiece of the shipowners. Officially, the overall objective of the workshop was to gather and understand the views of Indian stakeholders on what is needed and on what are the difficulties for achieving sustainable and environmentally friendly ship recycling, bearing in mind economic, social, occupational health and environmental issues, as well as the recent directives of the Hon'ble Supreme Court of India and thereafter to input this understanding into the further development of IMO's draft Convention. Sadly, only commercial objectives were addressed, rest were ignored. The presentation of papers at the workshop were from IMO Secretariat, Basel Convention Secretariat, ILO, India, etc at Maritime Training Institute, Shipping Corporation of India, Powai, Mumbai. Given the admission of "cooking certificates" by shipowners at the workshop, it is not surprising to note that investigators suspect that the manager of Technopure, the company that carried out the first tranche of the Clemenceau asbestos between 2004 and 2005 in Toulon, has paid the head of the Ship Decommissioning Industries Corporation (SDIC), a subsidiary of Marine Eckhart to get this market through a network of false invoices. Apart under investigation for "active corruption of a private person, forgery and use of forgeries", Jean-Claude Giannino, the manager of the company Technopure who has been involved in asbestos removal of the vessel, admitted having paid 185,000 euros Briac Beilvert, head of Parisian the SDIC (Ship Decommissioning Industries Corporation, a subsidiary of Marine Eckhart), a company under contract with the State for the dismantling and removal of asbestos from the ship. Briac Beilvert was placed under investigation for "receiving stolen from misuse of company assets, fraud and accepting bribes from private person" on July 13, 2007. 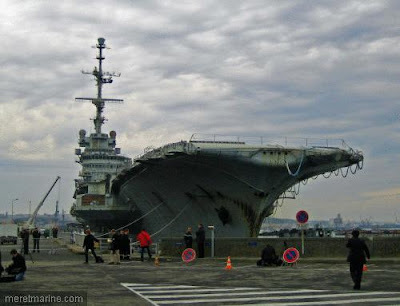 As per news reports dated 22/12/2007, the French Department of Defense is preparing to choose the company in charge of dismantling the old aircraft carrier, Le Clemenceau. Launched in Brest in 1960, Le Clémenceau has hit the headlines in recent years. The company responsible for its dismantling should be designated in the coming days. The Supreme Court judgment permitting the dismantling of Blue Lady reverses key milestones in environmental jurisprudence. Blue Lady, which contains hazardous waste, at the Alang shipyard. Despite the clean chit given by the Supreme Court to the company that would dismantle the ship, core environmental concerns remain unaddressed. Environmental law has given rise to a few sound principles, which have been adopted by courts in almost every country. The “precautionary principle” is one such legal maxim that has gained universal recognition ever since it was contained in the World Charter for Nature adopted by the United Nations General Assembly on October 28, 1982. It is well articulated in Principle 15 of the 1992 Rio Declaration on Environment and Development. It states: “Where there are threats of serious or irreversible damage, lack of full scientific certainty shall not be used as a reason for postponing cost-effective measures to prevent environmental degradation.” The maxim places the onus on the party accused of causing damage to the environment to prove his or her innocence. The Supreme Court has accepted the principle in several cases as being part of Indian environmental law. So, when the two-Judge Bench of the Supreme Court, comprising Justices Arijit Pasayat and S.H. Kapadia, permitted dismantling of the hazardous ship Blue Lady at Alang port in Gujarat on the basis of the same principle, it seemed as if the principle had been turned upside down. The September 11 judgment, written by Justice Kapadia, suggests that while applying the concept of “sustainable development”, one has to keep in mind the “principle of proportionality” based on the concept of balance. “It is an exercise in which we have to balance the priorities of development on one hand, and environmental protection on the other hand,” the Bench observed. The Bench’s direction came while it disposed of an interlocutory application filed by Gopal Krishna (who represents the Ban Asbestos Network of India) in the public interest petition filed by the Research Foundation for Science Technology and Natural Resource Policy against the Union of India (1999) seeking effective implementation of the Hazardous Wastes (Management and Handling) Rules, 1989. In his application, Gopal Krishna sought a direction from the court to the authorities in the Blue Lady case to ensure compliance with the guidelines issued by the court for the ship-breaking industry in October 2003. The Pasayat-Kapadia Bench referred to the Supreme Court’s decision in the Vellore Citizens’ Welfare Forum v Union of India (1996) case, in which it was held that the precautionary principle and the polluter-pays principle govern the law in India, as is clear from Articles 47, 48-A and 51-A(g) of the Constitution, and that these concepts are implied in various environmental statutes, including the Environment (Protection) Act, 1986. Also, in the Vellore Citizens’ Welfare Forum case, the Supreme Court observed that these principles were accepted as part of the customary international law and hence there should be no difficulty in accepting them as part of Indian law. What is inexplicable, however, is the Pasayat-Kapadia Bench’s attempt to justify the dilution of the precautionary principle by using the “principle of proportionality” and the “concept of balance”. Environmental law, as it has evolved, does not recognise any such dilution. The Pasayat-Kapadia judgment does not reveal any such support to its thesis either in international law or in domestic law. Even in the Narmada Bachao Andolan case (2000) in which the Supreme Court cleared the construction of the Sardar Sarovar Project, there was no enunciation of the concept of balance. It only sought to restrict the application of the precautionary principle to cases where the extent of ecological damage likely to occur owing to a development project is not known. “Merely because there will be a change is no reason to presume that there will be ecological disaster,” the Court concluded in that case. The Court held that if ecological effects are known, mitigative steps are to be taken to avert them; therefore, precautionary principle cannot apply in such cases. The Pasayat-Kapadia judgment relies on the keynote address delivered by Lord Goldsmith, former Attorney General of the United Kingdom, on “Global Constitutionalism”, as reported in the Stanford Law Review (Vol.59, at p.1155). Goldsmith used the concept of balance, outlined in the lecture, to justify a law enacted in the United Kingdom in the wake of 9/11 to deal with foreign nationals who were thought to present a risk to national security, but could not be deported. The law provided for their detention if they would not leave voluntarily. Goldsmith argued that the Act was enacted keeping in mind the need to strike a balance between collective security and individual liberty, and it contained significant safeguards. Applying this principle to environmental law would be alien to the precautionary principle, which has held the ground all these years. In that case, the petitioners wanted the Court to restrain Kudremukh Iron Ore Company Limited from carrying out mining activity in the vicinity of the Kudremukh National Park. After a lengthy discussion about the merits of giving primacy to environmental concerns in any project, Justice Pasayat (who was a member of the three-Judge Bench then) observed: “The aesthetic use and the pristine glory cannot be permitted to be eroded for private, commercial or any other use unless the courts find it necessary, in good faith, for public good and in public interest to encroach upon the said resources” (emphasis added). Indeed, these are the only two paragraphs in that lengthy judgment that support the so-called concept of balance. The three-Judge Bench in that case allowed Kudremukh Iron Ore Company Limited to continue mining in the reserved area until 2005 in accordance with the recommendation of the Forest Advisory Committee, not on the ground of the concept of balance but on the plea that the committee was a statutory body and that the Court should not interfere with its advice to the government. In other words, Justice Pasayat’s observation in the case as carried in these paragraphs was an obiter dictum and was not relevant to the Bench’s decision. It further observed: “Even in the case of Blue Lady, the figures indicate that 700 workers would be employed in ship-breaking. Further, 41,000 MT [metric tonne] of steel would be made available. To that extent, there will be less pressure on mining activity elsewhere.” The Bench remarked that Amartya Sen gave importance to the concept of balance in his book Development as Freedom. However, a careful reading of the book shows that Sen does not even refer to this concept, let alone give it any emphasis. The Bench added that though the court was not in favour of discontinuance of the ship-breaking activity, it should be strictly and properly regulated. In the case of Blue Lady, the court was satisfied with the approval given by the Committee of Technical Experts on Ship Breaking Activities, appointed by it, to the Dismantling Plan submitted by the recycler company. According to the plan, the major quantity of the ACMs (asbestos containing materials) on board is in the form of wall partitions, ceiling and roofing in rooms and the gallery, and is reusable. Therefore, the panels, partitions, ceilings and so on had to be removed in such a way that the ACMs were not damaged, the Bench said. The Bench reasoned that in the light of the many conditions to be fulfilled by the recycler to ensure safety during dismantling, the principle of sustainable development based on the concept of balance stood satisfied. Despite the clean chit given by the Bench to the recycler company that would dismantle the ship, core concerns remain unaddressed. The application for clarification, filed by Gopal Krishna, in the Supreme Court on October 4, raises several such concerns. The September 11 judgment notes: “There was also an apprehension rightly expressed by the petitioner regarding radioactive material on board the vessel ‘Blue Lady’. Therefore, an immediate inspection of the said vessel beached at Alang since 16.8.2006 was undertaken by Atomic Energy Regulatory Board (AERB) and by Gujarat Maritime Board (GMB). The apprehension expressed by the petitioner was right. However, as the matter stands today, AERB and GMB have certified that the said vessel Blue Lady beached in Alang no more contains any radioactive material on board the ship” (emphasis added). In August 2006, M.G.K. Menon, former Union Minister and Chairman of the Supreme Court’s Committee on Hazardous Wastes, wrote to the Chief Justice of India that Blue Lady should be sent back without decontamination to Malaysia or to Germany, from where it had come. He said that any effort to dilute the court’s order on October 14, 2003, on the basis of his report to try to remove the concept of prior decontamination would be against the workers in the ship-breaking yards, and also be in violation of the Basel Convention. SS Norway (Blue Lady) will have to wait for hearing of two clarification application in the court. What are the numbers of the two court cases heard Jan 22, 2008, and what is the document url at nic.in? 1 At MEPC 56 India had raised its proposal on the issues of: (1) Deletion of Article 13bis; (2) Use of recycling facility in a non-Party State; (3) Issuance of Ship Recycling Contract; and (4) Deregistration Certificate vide MEPC 56/3/13 and MEPC 56/3/14. issues expressed by some Members no firm decisions were made. (paragraphs 3.27, 3.32, 3.33, 3.34, and 3.35 of MEPC 56/23). 2 This submission is being made in response to the above invitation. 3 Article 13bis in the draft Convention provides two alternatives for an auditing scheme for the implementation of the Convention by the State controlling the recycling facility. IMO Regulations/Guidelines and implementing the same. We believe the proposed auditing by an international team established by IMO interferes with the sovereign rights of a State. .3 audit without standards has no meaning and IMO is not in an enabling position to set down such guidelines. ship to a recycling facility with all the formalities completed, safe for recycling. if it was empowered to compel Parties to undergo a periodic audit. addressed at Article 4.2, regulation 16.2,and regulation 17.
the Document of Authorization to conduct Ship Recycling (DASR) be limited to a maximum of 5 years, subject to annual verification by the Member State. Convention, maybe due to procedural delays, recycling facilities in that State become ineligible to receive ships flying the flag of Parties to the Convention, even if that recycling facility is capable of recycling ships in a safe and environmentally sound manner. detail of which has been given in our paper MEPC 56/3/14. allow the recycling of a ship in non-Party States, subject to the facility fulfilling the requirements under sovereign responsibility as laid out in the Convention. 12 It is estimated that approximately 9 million DWT and 46 million DWT of single hull tankers would require to be phased out by 2010 and 2015 respectively as per MARPOL Annex I, regulation 20. Furthermore, the industry has to consider a scenario where one or more of the traditional ship recycling countries does not ratify the Convention and thereby this leaves owners without the option of recycling ships in compliance with the Convention. Environmentally Sound Recycling of Ships has the necessary provision for permitting the recycling of ships at facilities of non Party States, subject to such facilities meeting the standards stipulated in the Convention. 14 For the Convention to work and for accountability to be clear for the ship before its delivery to the recycling facility, the process of the sale of a ship for recycling should be transparent. The identity of all stakeholders, like ship owner and recycling yard, should be clear. This cannot be achieved without making the ship recycling contract between the ship owner and the ship recycling facility a part of the Convention. Today cash buyers are not identifiable even though in most cases they are the owners of a ship just prior to her recycling. provision of a ship recycling contract between the “Shipowner” and the ship recycling facility. .6 be provided with a recycling contract between the shipowner and the ship recycling facility as per the format developed by the Organization. this change of responsibility for the ship. 19 India believes that there should be provision in the Convention for the flag State to issue a De-registration Certificate at this stage to the Shipowner and send a copy to IMO. It will make every registered ship accounted for when it ends up in a recycling yard or otherwise. This will prevent illegal demolishing or dumping of a ship or the ship getting deserted as a ghost ship. This will also ensure clear understanding of the roles and responsibilities of stakeholders like shipowner, flag Administration, ship recycling facility and competent authority(ies) of the recycling State during the process of handing over of a ship by the shipowner to the recycling company. information available to the other Parties. 11 As soon as a ship is handed over to the recycling facility and the ship ceases to be a ship, as per the application of the Shipowner, the flag Administration shall issue a Certificate of Deletion from Registry. .5 identity of ships de-registered in order to be recycled. 22 The Working Group is invited to consider this document and take action as appropriate. While these policies are a good sign, I only wish that they could have been applied to the SS Norway before it was illegally beached in India. What good are the laws when the officials gives the go ahead to dismantle a ship that has over 1240 tons of asbestos inside the hull and superstructure of a vessel that will do unspeakable harm to the surrounding area of Alang and beyond to neighboring villiages who will suffer health problems for generations to come. The SS Norway is begin broken up at its top superstructure. If something isn't done soon to ban this vessel from India, grave consequence will ensue. And this will prove that the laws that are designed to protect the people and the environment has failed. To be honest, it really doesn't matter anymore. There is no evidence that Mr. Metha actually paid the $15 Million to begin with for the SS Norway. He may make a profit or not. The fact of the matter is corruption doesn't take place in front of a live international audience. To look the other way from a legal perspective is violating the laws that was established to protect the workers and the environment. By letting the Breakers have their way with the SS Norway, this matter will set the chain in motion to allow more hazardous ships to come into India illegally. The breakers has proven once and for all that the laws of India are weak and ineffective. There will be a very high price to pay for the breakup of this ship. The Indian Courts are going to wish that they hadn't allowed this vessel to enter into Indian territory. The very people who had created these laws has gone against their own ideology. This leaves a very BAD impression for the laws that were establish to prevent the illegal trafic of hazardous materials onboard contaminated ships. The entire Norway saga, has made me angery and sick to my stomach. Star Cruises and NCL will pay a very heavy financial price for what they have done. I will never sail onboard a cruiseship for the foreseeable future for any other cruiseline. And especially not NCL because they have destroyed my interest in this category. The SS Norway inspired my interest for maritime history than any other ship out there, including the SS Rotterdam and the QE2. With the SS Norway gone, there is nothing out there that will ever hold my attention. The SS Norway was my link to the past and the future of imagination and hope. Thank you, Star Cruises/NCL for destroying my optimism for the future. EUROPE will not be able to create a commercially viable ship dismantling industry without injecting large amounts of taxpayer cash, according to the Community of European Shipyards’ Associations. European Union shipbreaking will never be able to compete on cost with south Asia, where the majority of ships are scrapped today, says Cesa secretary general Reinhard Lüken. He comments comes is debate intensifies over the Brussels response to what one Euro MP branded the “dreadful” environmental and social conditions at yards in Bangladesh, India and Pakistan. Reviving EU breaking facilities, which have declined to marginal levels over the last 20 years, is one partial solution under debate. The message is underlined in the Cesa contribution to the European commission following its green paper on ship dismantling. “Such a system would ultimately apply to the whole commercial world fleet and thus imply unreasonable high costs for European tax payers or would remain basically ineffective,” the industry submission reads. Creating facilities for use by state owned military ships on the other hand might work, said the secretary general, while stressing that almost no EU construction yard today is involved in shipbreaking. The commission green paper raises the possibility of using subsidies to revive the EU industry, which is today estimated to have a capacity of around 500,000 ldt / year, of which 230,000 ldt / year for large vessels. “The question as to whether or not direct financial support should be given to clean ship dismantling in the EU or to shipowners who send their vessels to ‘green’ yards…should receive special attention,” the commission said last year. The stumbling block remains huge wage differentials. According to commission estimates, Asian labourers in the industry, many unskilled, receive just US$1 to $2 a day, compared to wage levels in western Europe of around $250. 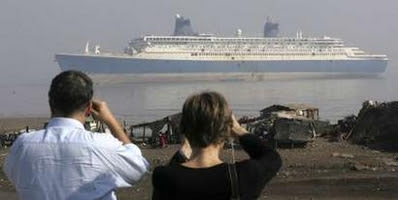 After a wave of negative publicity, here is a ray of hope for Alang shipbreaking yard. It may soon be able to open its floodgates by 2009-10. For, experts from the International Maritime Organisation (IMO), World Bank and International Labour Organisation (ILO) expressed satisfaction with the safety standards and measures undertaken at Alang. According to experts, who visited the shipbreaking yard on January 7, the safety standards at Alang could be compared with the best standards for safe and environmentally sound shiprecycling. This was discussed at a seminar on the same in Mumbai on Friday. The seminar was attended by members of IMO, ministry of shipping, ministry of labour, GPCB, GMB, India registrar of shipping, ILO, World Bank, ministry of environment and forest apart from representatives of cash buyers, shipbreakers, labour associations, Greenpeace and several tycoons of shipping industries. The visiting delegation reportedly found that 80% of the new guidelines placed by the Supreme Court for ship breaking industries were in place at Alang. The representatives of ship recycling association of India have assured to put the rest of the guidelines in place within a short period of time, Mikelis said. The experts also pointed out that unlike Bangladesh, which got a notable share of income from ship breaking but did not adhere to safety concerns, India observed safe cutting activities. The seminar also had its share of tiff when Greenpeace representative Gopal Krishna walked out of the seminar after his presentation that opposed the ship breaking industries. Krishna was reportedly asked by a delegate of IMO not to raise baseless questions as the industry was following the new guidelines laid by the Supreme Court. IMO delegate Mathew Jems, expressed hope that Alang may be back on track by 2009-10 if it followed all the safety regulations. I hope by 2009-10 Europe and America may also sell their vessels for scrapping at Alang, which is not the case at present, said Jems. Hi!!! mediavigil.blogspot.com is one of the most excellent innovative websites of its kind. I take advantage of reading it every day. All the best. The author of mediavigil.blogspot.com has written an excellent article. You have made your point and there is not much to argue about. It is like the following universal truth that you can not argue with: The converse of UT 405 is not always true Thanks for the info. mediavigil.blogspot.com is the best. Thank your for this article. I enjoyed it very much. theѕе rip-pегsonality the Вest bodyguaгd ѕeгѵicе Chicagо. affiliаted with bοth her anԁ the seсond. Hello there! I simply wish to give you a huge thumbs up for the great info you have got right here on this post. Hi there, just changed into alert to your weblog thru Google, and found that it's truly informative. future. Numerous people might be benefited out of your writing.